Some Democrats are also concerned. 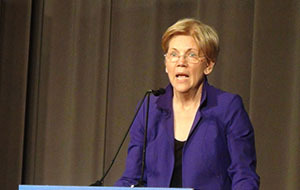 Barney Frank, who helped write Dodd Frank when he was representing Massachusetts in Congress, said he was surprised to see Warren call out the Democrats voting for the bill by name and thinks she made a “mistake” doing so. Frank said he believes naming the Democrats sent the message Warren wanted to “punish” Democrats who backed the changes. Meanwhile, last night, Elizabeth Warren made her “first big national political move” by announcing she was donating $265,000 to Democratic parties across the country. Warren may want state party leaders to think she is playing nice, but her attacks on Senate Democrats in Washington not only exacerbates the Democratic civil war taking place across the country but threatens the vulnerable Senate incumbents that some of these state parties are desperately trying to protect.